For a detailed description about how to analyze the Quality Report: Quality Report Help. The Quality Report is automatically displayed after each step of processing. To not be displayed automatically, unselect the Display Automatically after Processing box at the bottom of the Quality Report. Error: Description of the error that made processing fail. Substep: The substep of Initial Processing at which the processing fails. Solutions: Description of the possible solutions with a link to step by step instructions. Project: Name of the project. Processed: Date and time of processing. Camera Model Name(s) The name of the camera model(s) used to capture the images. Rig Name (s) The name of the rigs used to capture the images. If a rig is detected, all the cameras of the rig will appear in the Camera Model Name above. Average Ground Sampling Distance (GSD): The average GSD of the initial images. For more information about the GSD: Ground sampling distance (GSD). Area Covered: The 2D area covered by the project. This area is not affected if a smaller Processing Area has been drawn. Time for Initial Processing (without report): The time for Initial Processing without taking into account the time needed for the generation of the Quality Report. Images: The median of keypoints per image. Keypoints are characteristic points that can be detected on the images. Failed Processing Report: displayed if the information is not available. Dataset: Number of enabled images that have been calibrated, i.e. the number of images that have been used for the reconstruction of the model. If the reconstruction results in more than one block, the number of blocks is displayed. This section also shows the number of images that have been disabled by the user. If processing fails, the number of enabled images is displayed. Between 60% and 95% of enabled images are calibrated, or more than 95% of enabled images are calibrated in multiple block. Camera Optimization: Perspective lens: The percentage of difference between initial and optimized focal length. Fisheye lens: The percentage of difference between the initial and optimized affine transformation parameters C and F.
Perspective lens: The percentage of difference between initial and optimized focal length is less than 5%. Fisheye lens: The percentage of difference between initial and optimized affine transformation parameters C and F is less than 5%. Perspective lens: The percentage of difference between initial and optimized focal length is between 5% and 20%. Fisheye lens: The percentage of difference between initial and optimized affine transformation parameters C and F is between 5% and 20%. Perspective lens: The percentage of difference between initial and optimized focal length is more than 20%. Fisheye lens: The percentage of difference between initial and optimized affine transformation parameters C and F is more than 20%. Matching: The median of matches per calibrated image. Georeferencing: Displays if the project is georeferenced or not. If site calibration transformation has been used, site calibration is displayed. If only the image geolocation has been used, no GCP is displayed. If GCPs are used, the number, type and the mean of the RMS error in (X,Y,Z) is displayed. If processing fails, the number of GCPs defined in the project is displayed. Using GCPs and the GCP error is less than 2 times the average GSD. GCPs are used and the GCP error is more than 4 times the average GSD. Figure 1: Orthomosaic and the corresponding sparse Digital Surface Model (DSM) before densification. Number of Geolocated Images: Number of the images that are geolocated. Figure 2: Top view of the initial image position. The green line follows the position of the images in time starting from the large blue dot. 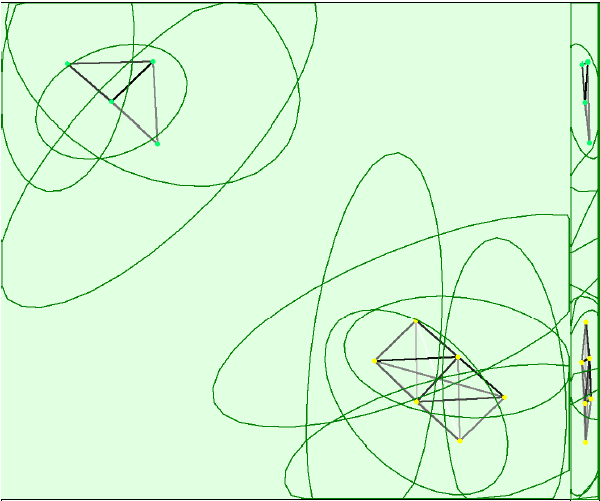 Figure 3: Offset between initial (blue dots) and computed (green dots) image positions as well as the offset between the GCPs initial positions (blue crosses) and their computed positions (green crosses) in the top-view (XY plane), front-view (XZ plane), and side-view (YZ plane). Dark green ellipses indicate the absolute position uncertainty (Nx magnified) of the bundle block adjustment result. Mean X/Y/Z: Mean uncertainty in the X/Y/Z direction of the absolute camera positions. Mean Omega/Phi/Kappa: Mean uncertainty in the omega/phi/kappa orientation angle of the absolute camera positions. Mean Camera Displacement X/Y/Z: Only available for projects processed with Linear Rolling Shutter. Mean uncertainty in the camera displacement in the X/Y/Z direction of the absolute camera positions. Sigma X/Y/Z: Sigma of the uncertainties in the X/Y/Z direction of the absolute camera positions. Sigma Omega/Phi/Kappa: Sigma of the uncertainties in the omega/phi/kappa angle of the absolute camera positions. Sigma Camera Displacement X/Y/Z: Only available for projects processed with Linear Rolling Shutter. Sigma of the uncertainties in the camera displacement in the X/Y/Z direction of the absolute camera positions. Figure 4: Number of overlapping images computed for each pixel of the orthomosaic. Red and yellow areas indicate low overlap for which poor results may be generated. 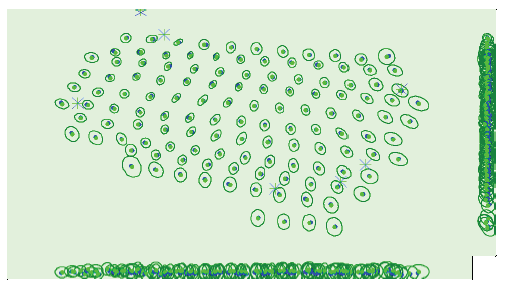 Green areas indicate an overlap over 5 images for every pixel. Good quality results will be generated as long as the number of keypoint matches is also sufficient for these areas (see Figure 5 for keypoint matches). Number of 2D Keypoint Observations for Bundle Block Adjustment: The number of automatic tie points on all images that are used for the AAT/BBA. It corresponds to the number of all keypoints (characteristic points) that could be matched on at least two images. Number of 3D Points for Bundle Block Adjustment: The number of all 3D points that have been generated by matching 2D points on the images. Mean Reprojection Error [pixels]: The average of the reprojection error in pixels. Each computed 3D point has initially been detected on the images (2D keypoint). On each image, the detected 2D keypoint has a specific position. When the computed 3D point is projected back to the images it has a re-projected position. The distance between the initial position and the re-projected one gives the re-projection error. For more information: Reprojection error. The camera model name is also displayed as well as the sensor dimensions. EXIF ID: The EXIF ID to which the camera model is associated. Initial Values: The initial values of the camera model. Optimized Values: The optimized values that are computed from the camera calibration and that are used for processing. Uncertainties (sigma): The sigma of the uncertainties of the focal length, the Principal Point X, the Principal Point Y, the Radial Distortions R1, R2 and the Tangential Distortions T1, T2. Focal Length: The focal length of the camera in pixels and in millimeters. If the sensor size is the real one, then the focal length should be the real one. If the sensor size is given as 36 x 24 mm, then the focal length should be the 35mm equivalent focal length. R1: Radial distortion of the lens R1. R2: Radial distortion of the lens R2. R3: Radial distortion of the lens R3. T1: Tangential distortion of the lens T1. T2: Tangential distortion of the lens T2. Residual Lens Error: This figure displays the residual lens error. The number of Automatic Tie Points (ATPs) per pixel averaged over all images of the camera model is color coded between black and white. White indicates that, on average, more than 16 ATPs are extracted at this pixel location. Black indicates that, on average, 0 ATP has been extracted at this pixel location. Click on the image to the see the average direction and magnitude of the reprojection error for each pixel. Note that the vectors are scaled for better visualization. Uncertainties (Sigma): The sigma of the uncertainties of the Polynomial Coefficient 1,2,3,4 and the Affine Transformation parameters C,D,E,F. The correlation between camera internal parameters determined by the bundle adjustment. 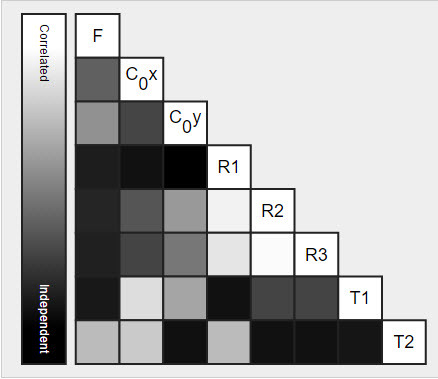 The correlation matrix displays how much the internal parameters compensate for each other. White indicates a full correlation between the parameters, i.e. any change in one can be fully compensated by the other. Black indicates that the parameter is completely independent, and is not affected by other parameters. Number of 2D Keypoints per Image: Number of 2D keypoints (characteristic points) per image. 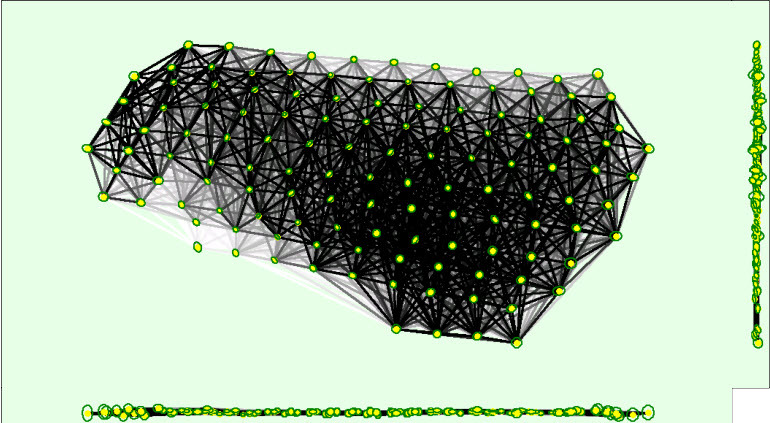 Number of Matched 2D Keypoints per Image: Number of matched 2D keypoints per image. A matched point is a characteristic point that has initially been detected on at least two images (a 2D keypoint on these images) and has been identified to be the same characteristic point. Median: The median number of the above mentioned keypoints per image. Min: The minimum number of the above mentioned keypoints per image. Max: The maximum number of the above mentioned keypoints per image. Mean: The mean / average number of the above mentioned keypoints per image. camera model name If more than one camera model is used, the number of 2D keypoints found on images associated to a given camera model name is displayed. Median / 75% / Maximum: The median, 75% (upper quartile), maximum number of matches between two camera models. If a cell is empty, no matches have been computed between the corresponding cameras. Each 3D point is generated from keypoints that have been observed on at least two images. Each row of this table displays the number of 3D points that have been observed in N images. The higher the image number on which a 3D point is visible, the higher its accuracy is. Figure 5: Top view of the image computed positions with a link between matching images. The darkness of the links indicates the number of matched 2D keypoints between the images. Bright links indicate weak links and require Manual Tie Points or more images. Dark green ellipses indicate the relative camera position uncertainty (Nx magnified) of the bundle block adjustment result. 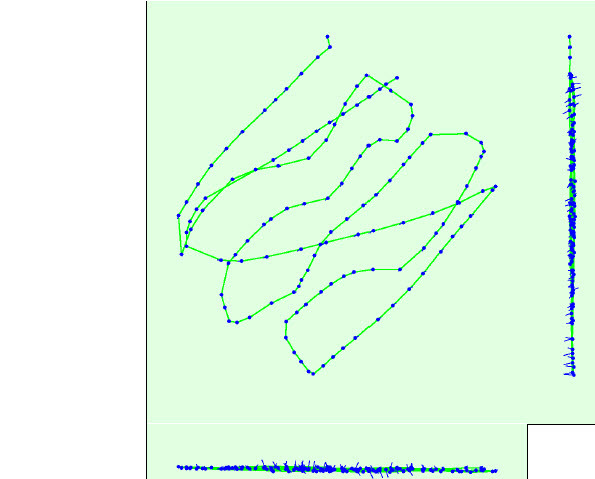 Mean X/Y/Z: Mean uncertainty in the X/Y/Z direction of the relative camera positions. Mean Omega/Phi/Kappa: Mean uncertainty in the omega/phi/kappa orientation angle of the relative camera positions. Mean Camera Displacement X/Y/Z: Only available for projects processed with Linear Rolling Shutter. Mean uncertainty in the camera displacement in the X/Y/Z direction of the relative camera positions. Sigma X/Y/Z: Sigma of the uncertainties in the X/Y/Z direction of the relative camera positions. Sigma Omega/Phi/Kappa: Sigma of the uncertainties in the omega/phi/kappa angle of the relative camera positions. Sigma Camera Displacement X/Y/Z: Only available for projects processed with Linear Rolling Shutter. Sigma of the uncertainties in the camera displacement in the X/Y/Z direction of the relative camera positions. MTP Name: The name of the Manual Tie Point. Projection Error [pixel]: Average distance in the images where the Manual Tie Point has been marked and reprojected. Verified/Marked: Verified: The number of images on which the Manual Tie Point has been marked and are taken into account for the reconstruction. Marked: The images on which the Manual Tie Point has been marked. Check Point Name: The name of the Check Point. The Accuracy XY of the GCP/Check Point that has been given by the user in XY direction / The Accuracy Z of the GCP/Check Point that has been given by the user in Z direction. The accuracy indicates the accuracy of the GCP/Check Point in each direction. The difference between the computed GCP/Check Point 3D point and the original position in X direction (original position - computed position). The difference between the computed GCP/Check Point 3D point and the original position in Y direction (original position - computed position). The difference between the computed GCP/Check Point 3D point and the original position in Z direction (original position - computed position). Projection Error [pixel]: Average distance in the images where the GCP/Check Point has been marked and where it has been reprojected. Verified/Marked: Verified: The number of images on which the GCP/Check Point has been marked and are taken into account for the reconstruction. Marked: The images on which the GCP/Check Point has been marked. The mean / average error in each direction (X,Y,Z). For more information: How are the GCP Errors defined in the Quality Report?. The standard deviation of the error in each direction (X,Y,Z). For more information: How are the GCP Errors defined in the Quality Report?. The Root Mean Square error in each direction (X,Y,Z). For more information: How are the GCP Errors defined in the Quality Report?. Scale Name: Name of the Scale Constraint. Initial Length [ft]: Length measured in the field representing the real length of the scale constraint. Initial Length Accuracy [ft]: Accuracy of the measurements in the field. Computed Length [ft]: Length measured in the 3D model. Computed Length Error[ft]: The Computed Length Error is given by the difference between the Computed Length and the Initial Length. GCP/MTP Label 1: Label of the first manual tie point associated to the Scale Constraint. GCP/MTP Label 2: Label of the second Manual Tie Point associated to the Scale Constraint. Mean [ft]: The mean / average Computed Length Error. Sigma [ft]: The standard deviation of the Computed Length Error. Orientation Name: Name of the Orientation Constraint. 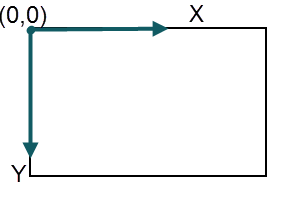 Computed Angular Error [degree] Angular difference between the computed axis and the axis that was drawn. GCP/MTP Label 1: Label of the first Manual Tie Point associated to the Orientation Constraint. GCP/MTP Label 2: Label of the second manual tie point associated to the Orientation Constraint. Mean [degree]: The mean / average Computed Angular Error. 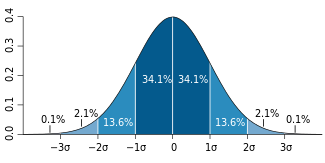 Sigma [degree]: The standard deviation of the Computed Angular Error. Number of geolocated and calibrated images that have been labeled as inaccurate. The input coordinates for these images are considered as inaccurate. Pix4Dmapper managed to find their correct optimized position but they are not taken into account for the following Geolocation Variance tables. The minimum and maximum error represent the geolocation error intervals between -1.5 and 1.5 times the maximum accuracy (of all X,Y,Z directions) of all the images. The percentage of images with geolocation errors in X direction within the predefined error intervals. The geolocation error is the difference between the camera initial geolocations and their computed positions. Geolocation error Y [%]: The percentage of images with geolocation errors in Y direction within the predefined error intervals. The geolocation error is the difference between the camera initial geolocations and their computed positions. Geolocation error Z [%]: The percentage of images with geolocation errors in Z direction within the predefined error intervals. The geolocation error is the difference between the camera initial geolocations and their computed positions. Mean: The mean / average error in each direction (X,Y,Z). Sigma: The standard deviation of the error in each direction (X,Y,Z). RMS error: The Root Mean Square error in each direction (X,Y,Z). This table is displayed only if GCPs are used in the project. It defines the bias between image initial and computed geolocation given in the output coordinate system. Translation [ft]: Translation between initial and computed image position in the output coordinate system. Rotation [degree]: Rotation between initial and computed image position in the output coordinate system. Displayed only if the output coordinate system is an arbitrary coordinate system. Scale: Scale between initial and computed image position in the output coordinate system. 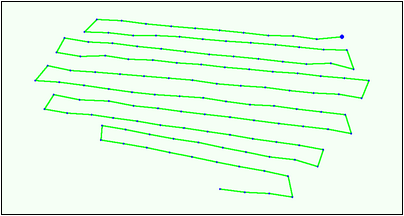 Geolocation orientation variance: Root Mean Square RMS error of the image orientation angles. The difference between the initial image orientation angles and the computed orientation angles. Omega: The RMS error in Omega angle in degrees. Phi: The RMS error in Phi angle in degrees. Kappa: The RMS error in Kappa angle in degrees. This table is displayed only if a Site Calibration Transformation is defined and enabled and if the output coordinate system is an arbitrary coordinate system. It defines the transformation from the projection of the site calibration to the output coordinate system. It can be used in projects where the images are in a known coordinate system and no GCPs are used in order to define the transformation to an arbitrary output coordinate system. Translation from the projection of the site calibration to the arbitrary output coordinate system. The X, Y, Z axes are defined in the output coordinate system. Rotation [degree]: Rotation from the projection of the site calibration to the arbitrary output coordinate system. The X, Y, Z axes are defined in the output coordinate system. Scale: Scale ratio between the projection of the site calibration and the arbitrary output coordinate system. The X, Y, Z axes are defined in the output coordinate system. Displayed in the table's caption. The transformation is the transformation from the projection system of the site calibration to an arbitrary output coordinate system. The goal is to verify if the relative geolocation error follows a Gaussian distribution. 68.2% of the geolocated and calibrated images should have a relative geolocation error in X, Y, Z between -1 and 1. 95.4% of the geolocated and calibrated images should have a relative geolocation error in X, Y, Z between -2 and 2. 99.6% of the geolocated and calibrated images should have a relative geolocation error in X, Y, Z between -3 and 3. Images X[%]: The percentage of geolocated and calibrated images with a relative geolocation error in X of one time, two times and 3 times the image geolocation accuracy. The percentage of geolocated and calibrated images with a relative geolocation error in Y of one time, two times and 3 times the image geolocation accuracy. The percentage of geolocated and calibrated images with a relative geolocation error in Z of one time, two times and 3 times the image geolocation accuracy. Mean of Geolocation Accuracy [ft]: The mean / average accuracy in each direction (X,Y,Z). Sigma of Geolocation Accuracy [ft]: The standard deviation of the accuracy in each direction (X,Y,Z). Figure 6: Camera movement estimated by the rolling shutter camera model. The green line follows the computed image positions. The blue dots represent the camera position at the start of the exposure. The blue lines represent the camera motion during the rolling shutter readout, re-scaled by a project dependent scaling factor for better visibility. Median camera speed: The median speed of the drone while taking the images. Median rolling shutter displacement (during sensor readout): The median rolling shutter displacement of the camera while taking the image (readout). Median rolling shutter time: The median time of taking an image. Hardware: CPU, RAM, and GPU for processing. Operating System: Operating System used for processing. Image Coordinate System Coordinate system of the image geolocation. Ground Control Point (GCP) Coordinate System Coordinate system of the GCPs, if GCPs are used. Detected Template: Processing Option Template, if a template has been used. Full: Automatically adjusts the Keypoints Image Scale for optimal results. Rapid: Automatically adjusts the Keypoints Image Scale for fast results. Custom: User selected Keypoints Image Scale. Image Scale: 1: Original image size. Image Scale: 2: Double image size. Image Scale: 0.5: Half image size. Image Scale: 0.25: Quarter image size. Image Scale: 0.125: Eighth image size. Aerial Grid or Corridor: Optimizes the pairs matching for Aerial Grid or Corridor flight paths. Free Flight or Terrestrial: Optimizes the pairs matching for Free Flight paths or Terrestrial images. Custom: The pairs matching parameters are selected by the user. Useful in specific projects and for advanced users only. Suggested if one of the options above does not provide the desired results. Number of Neighboring Images: How may images (before and after in time) are used for the pairs matching. Relative Distance Between Consecutive Images: All the images within the mentioned distance will be used in the pairs matching. Using as one unit distance the average distance between images. Maximum Number of Pairs for Each Image Based on Similarity: Maximum number of image pairs with similar image content. Maximum Number of Image Pairs per MTP: Maximum number of image pairs connected by a given MTP. Use Capture Time: Matches images considering the time on which they were taken. Use Triangulation of Image Geolocation: Only available if the images have geolocation. Only useful for aerial flights. The geolocation position of the images is triangulated. Each image is then matched with images with which it is connected by a triangle. Use Distance: Only available if the images have geolocation. Useful for oblique or terrestrial projects. Each image is matched with images within a relative distance. Use Image Similarity: Uses the image content for pairs matching. Matches n images with most similar content. Use MTPs: Images connected via a shared Manual Tie Point will be matched. Use Time for Multiple Cameras: When having multiple flights without geolocation using the same flight plan over the same area, and having different camera models for each flight, it matches the images from one flight with the ones from the other flight using the time information. Advanced: Matching Strategy: Images are matched either using or not the Geometrically Verified Matching. Automatic: The target number of keypoints is defined by the software. Custom: Number of Keypoints: User defined number of keypoints to extract. Calibration Method: Calibration method used. Standard: for the majority of the projects. Alternative: Optimized for aerial nadir images with accurate geolocation and low texture content, for example, fields. Accurate Geolocation and Orientation: Optimized for project with very accurate image geolocation and orientation. All: Optimizes all the internal camera parameters. None:Does not optimize any of the internal camera parameters. Leading: Optimizes the most important internal camera parameters. All: Optimizes all the external camera parameters. None: Does not optimize any of the external camera parameters. Rotation: Optimizes only the orientation of the camera. Advanced:Automatic Sky Masking Only available for Bebod 2 projects. Only available for rig projects. Displays also if Multiscale is used. Minimum Number of Matches: The minimum number of matches per 3D point represents the minimum number of valid re-projections of this 3D point on the images. It can be 2-6. 3D Textured Mesh Generation: Displays if the 3D Textured Mesh has been generated or not. 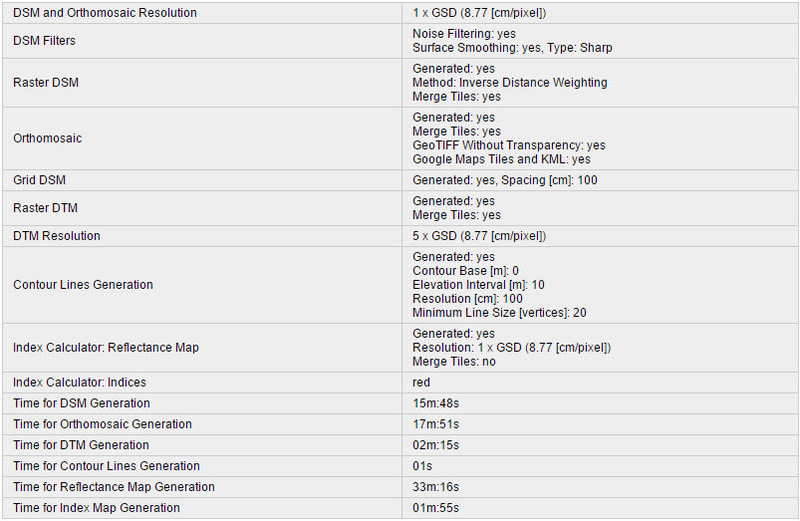 Displays the Processing Settings for the 3D Textured Mesh generation. Maximum Number of Triangles, the number depends on the geometry and the size of the project. Color Balancing: It appears when the Color Balancing algorithm is selected for the generation of the texture of the 3D Texture Mesh. Generated: It can be yes or no. Sample Density Divider: It can be between 1-5. Advanced: Matching Window Size: Size of the grid used to match the densified points in the original images. 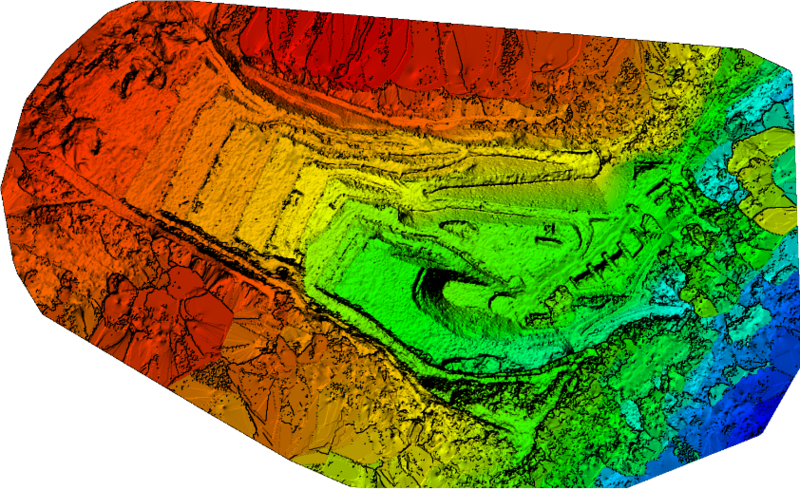 Advanced: Image Groups: Image groups for which a densified point cloud has been generated. One densified point cloud is generated per group of images. Advanced: Use Processing Area: Displays if the Processing Area is taken into account or not. Advanced: Use Annotations: If annotations are taken into account or not, as selected in the processing options for step 2. Point Cloud and Mesh. Advanced: Limit Camera Depth Automatically: Displays if the camera depth is automatically limited or not. 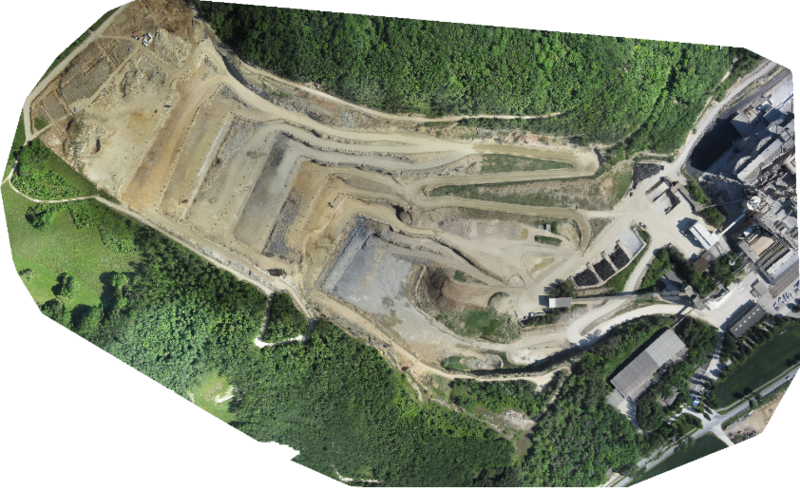 Time for Point Cloud Densification: Time spent to generate the densified point cloud. Time for Point Cloud Classification: Time spent to generate the classified point cloud. Time for 3D Textured Mesh Generation: Time spent to generate the 3D Textured Mesh. Displays NA if no 3D Texture Mesh has been generated. Number of Processed Clusters: Displays the number of clusters generated, if more than 1 cluster has been generated. Number of Generated Tiles: Displays the number of tiles generated for the densified point cloud. Number of 3D Densified Points: Total number of 3D densified points obtained for the project. Average Density (per m3): Average number of 3D densified points obtained for the project per cubic meter. DSM and Orthomosaic Resolution: Resolution used to generate the DSM and Orthomosaic. If the mean GSD computed at step 1. Initial Processing is used, its value is displayed. Displays if the DSM tiles have been merged into one file. Displays if the Orthomosaic is generated. Displays if the Orthomosaic tiles have been merged into one file. Displays if the GeoTIFF without Transparency and the Google Maps Tiles and KML are generated. Grid DSM: Displays if the Grid DSM is generated. Displays which Grid Spacing has been used. Raster DTM: Displayed if the DTM is generated. Displays if the Tiles are merged. DTM Resolution: Displays the resolution used to generate the DTM. Index Calculator: Radiometric Calibration: Displayed if the Radiometric Calibration has been used. Index Calculator: Reflectance Map: Displayed if the Reflectance Map has been generated. Displays the Resolution at which it has been generated as well as if the Reflectance Map Tiles have been merged into one file. Index Calculator: Indices: Displayed if Indices have been generated. Displays the list of generated Indices. Index Calculator: Index Values: Displayed if the Indices have been exported as Point Shapefile Grid Size or as Polygon Shapefile. Displays the grid size for the generated outputs. Time for DSM Generation: Time spent to generate the DSM. Time for Orthomosaic Generation: Time spent to generate the Orthomosaic. Time for DTM Generation: Time spent to generate the DTM. Time for Contour Lines Generation: Time spent to generate the Contour Lines. Time for Reflectance Map Generation: Time spent to generate the Reflectance Map. Time for Index Map Generation: Time spent to generate the Index Map. Displays the name of the camera. Displays the bands of the camera to which a Radiometric Correction was applied. Displays the type of Radiometric Correction applied to the images of a band: Camera Only, Camera and Sun Irradiance, or Camera, Sun Irradiance and Sun Angle.